What the Sumerians would thing of all this? Why isn't the Gammon played with one die on the table? How is the game going on? How did the author write this book? 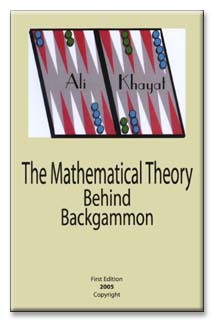 AUTHOR: Ali A. Khayat, author of The Mathematical Theory behind Backgammon, and author of other books. He received an Associate Degree from "Institute of Financial & Commercial Science" in 1969. He worked in Iraqi Government's offices until August 1980 as, an Accounts Auditor and Advisor in Cost price. Over the past 20 years, some of his best friends have called him "Mr. Backgammon." They were meeting to play Gammon in free time at Baghdadi-Znad Coffee House beside Tiger River in Baghdad where they enjoyed the cool summer breeze in the evening. He was teaching his friends that every point has a relationship between Gammon and the Dice or the Astrology Zodiac in signs. Mr Khayat came to the United States on June 1990 after the first Gulf War over to live with his brother and his sister in California. He studied at Clovis Adult Education, and Fresno City College. He received a Certificate of Achievement in 1998.